Our HubSpot integration automatically syncs and manages customer details in HubSpot’s CRM. HubSpot is a global leader in marketing automation with an incredibly user-friendly CRM that many of our customers use to collect, track and centralize customer data at scale. Integrating Acquire’s live chat product with HubSpot CRM allows you to access and create CRM contacts right from your Acquire dashboard as you and your team are handling active live chat conversations. With this integration, you can streamline your customer support process and keep your customer details stored and synced with HubSpot. Automatically sync customer details and conversations with your customer data system of record in HubSpot. Keep your HubSpot customer contact details updated. Manually create “contacts” in HubSpot from Acquire with a single click. Manage contact information without leaving your Acquire live chat session. Notes and chat transcripts from Acquire are automatically synced with the right customer contact in HubSpot’s CRM. Go to https://app.acquire.io Dashboard > Setting > Integration > Click On HubSpot. After clicking on HubSpot, you will be redirected to the page where you will need to enter HubSpot’s Admin account credentials to log in. After the successful connection, you can now choose to send contacts/leads and their conversations manually or automatically. By enabling auto sync, all contact details from Acquire will sync automatically with HubSpot’s CRM. Once setup is complete, go to your https://app.acquire.io/ dashboard and your customer’s details will automatically sync with the right contacts in HubSpot. You can create a new contact in HubSpot for each new contact in Acquire. Once the chat is complete, click the HubSpot button in the customer profile view. The customer’s details will get saved in the HubSpot CRM. 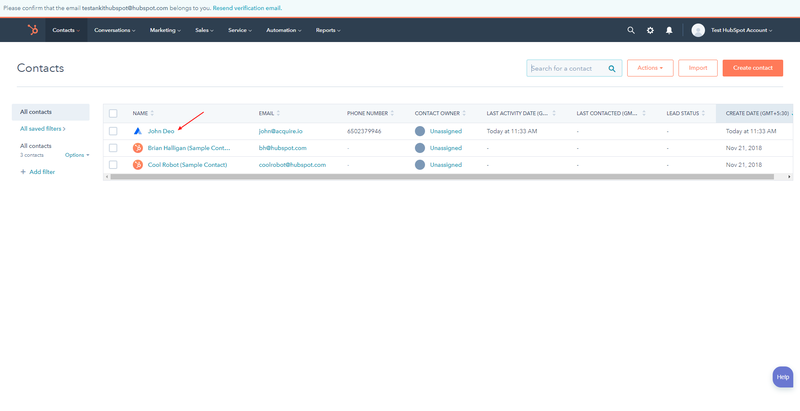 You can retrieve the customer details and chat transcripts from the HubSpot CRM – it will appear under each contact’s activity history in HubSpot. If you are experiencing any trouble with this integration, please feel free to contact us at hello@acquire.io. Check out our other integrations here!